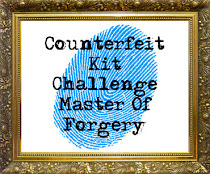 Welcome to my debut as a Master Forger for the Counterfeit Kit Challenge blog. Our monthly blog hop (which will now take place on the first of the month) is a great way to stretch your creative muscles before assembling your own kit. You will want to be sure to start at the beginning here to see all the wonderful and inspiring kits. You can also see the fantastic cast of forgers and our guest designer, Madeleine, in the list below, if you should happen to get lost along the way. Thanks for stopping by and happy scrapping! Oh, how this image makes me so sad! 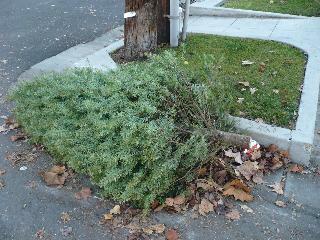 I know many who believe all Christmas decorations should be taken down before ringing in the New Year, but I just simply cannot subscribe to that. When it comes to Christmas, I am totally woo-woo over all the hustle and bustle. I love the warm glow of the little white lights and all the cozy decorations. It takes me quite a while to deck the halls inside and out and once the core busy-ness of the season hits, it seems we are non-stop with visiting and entertaining. I would NEVER consider taking my decorations down before New Year's. While Christmas may be over for the rest of the world, it lives on in my heart and home for at least a week or 2 more so I can savor it all. So, when I saw the January Counterfeit inspiration kit on Etsy (and how cool is that source?) I was thrilled to see a holiday/winter inspired kit to help keep my Christmas spirit alive throughout the month of January. NO Boxing Day at this house! These goodies are still sitting under the tree, but they will be put to good use soon. I stayed pretty true to the color and style of the inspiration kit. Cool turquoise against bright red is on trend these days and I love the addition of some pink and lime green. It is a bit of an avant garde combination, but it can totally speak Christmas with the right embellishments. Jingle bells and tinsel...oh what fun! add some pizzazz to a page. Silvery snowflake ribbon and red foil letters will be perfect to create a holiday or wintry page. Now, don't get me wrong...I won't be one of "those" people who leaves her tree up so long that I'll be hanging Easter Eggs on it in April, but you can be sure I'll savor what's left of this holiday for just a little bit longer - with my adhesive runner in hand! Welcome to the S.H.O. Time LOAD Blog Hop. It's just days away...are you ready? I've only recently started a blog and this is the first pre-LOAD blog hop in which I've ever participated. I'm the first stop on the blog train, but be sure to hop along to the 10 other lovely LOADsters who will share their experiences with you. 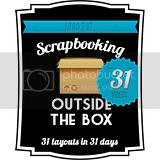 We hope you find lots of tips and advice to prepare for your month-long scrapbooking journey. 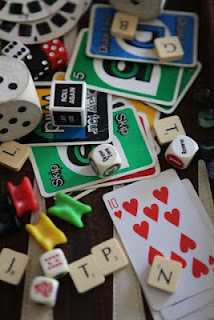 I could start this post with all the things you need to gather to be successful in LOAD. There's the obvious things like gathering cardstock and adhesive (more than you'll think you need). You could be super organized and assemble page kits and prepare meals in advance. Yes, all of those things are important and useful to a successful LOAD, but I'm going to take the preparation a little bit deeper by helping you create a checklist to mentally prepare for LOAD. In other words, some advice to help you get your head in the game. "If I only had a die cut machine..."
"If I only had a scrap room..."
"I can't scrap at home with the kids..."
"My supplies aren't current enough..."
"I don't have the time to scrapbook..."
"I don't have a fancy camera..."
"I need a large format printer..."
I pushed these excuses (and many more) aside and started scrapping. I took the pictures from the boxes, the stories from my head, and the supplies from the shelves and created something real and tangible. I felt a great sense of accomplishment at the end of the month as I admired my thick stack of layouts. I didn't have one thing prepared prior to that LOAD except a mental shift and the determination to succeed. So, in addition to gathering supplies, here's a mental checklist to get your head in the game for a successful LOAD. Let go of perfection. I know, I know...easier said than done. You are talking to a Virgo here, so I really know. Done is better than perfect. Give yourself permission to try different styles. I encourage you, when possible, to stick to the prompts (not because Leslie and I put them together), but you may just find a new scrappy technique or a story buried in your heart that will surprise you. LOAD doesn't leave much time for indecisiveness, but don't fret too long over your decisions. Go with your gut and you'll be amazed how satisfied you are in the end. Kill maybe. I have found when I have my scrapbook mojo going, everything else seems to fall into place. The dishwasher gets unloaded faster, the laundry folded, and meals prepped when I know I have some "me scrapbook time" coming my way. Scraplift freely. Don't try to re-invent the wheel or think by doing so that you're not really creating. Work in small chunks by mentally preparing your page throughout the day or setting out a few pictures and paper in the morning. Revisit your page, if possible, as the day goes on to add an element here or there. Have fun and enjoy the process. This is your hobby and these are your memories. It's not supposed to be a chore. 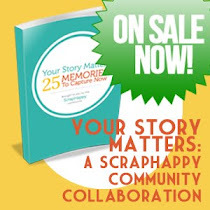 And when you are having a rough day and scrapbooking IS feeling like a chore, come back here and re-read this list, reach out to fellow scrappers in the gallery and remember your scrapbooking "why". We're all rooting for you to succeed! Can you tell I've been brainwashed, a-hem, trained by the scrappy guru herself, Lain? I am eternally grateful to her for the transformation that happened to me in October 2010. I hope you find this month productive, fun and satisfying. Thanks for playing along. Be sure to hop along to all of your other fellow LOADsters' blogs as I'm sure you'll find lots of tips and advice to get you LOADivated! And, tell us you stopped by with a comment! Lynnette http://sassyscrapper2010.blogspot.com YOU ARE HERE! NEXT STOP: LESLIE! Oh, and about wasted money? LOAD was seriously the best $30 I've ever spent! My daughter's beloved sunflowers. She and her friend Amelia would sing happy birthday to the little seedlings almost everyday. I think that may have been the secret to her success! This was a perfect month-end layout as it was easy to find scraps to cut the circles. Not much time to blog, but I wanted to share my latest creations with you. And another using the Whimsical Musings blog challenge of being inspired by ice cream. Ahhh...this brings me back to my teaching days and reading poetry to my kindergarteners and first graders. Isn't that a sweet little poem? Whenever I see a denim jean pocket, I think of this poem. Did you notice the denim pocket in the inspiration kit? I did right away. I thought about finding an old pair of jeans to cut out the pocket for my kit, but I (of course...Murphy's Law) just cleaned out everyone's drawers. Not an old pair of jeans to be found. No problem! I can even counterfeit clothing...well, the pocket at least. One of my favorite sheets of paper in my whole collection of patterned paper is from Basic Grey from their Lauderdale collection called "Bandana" as shown below. I bought one sheet last year at Scrapbook Expo and used every last scrap of it. After a brief bout of paper withdrawal, I purchased a pack of 25 sheets off of ebay which was the perfect elixir. It's so versatile it has been in many kits I've counterfeited and has made an appearance in many a layout. Here's a little tutorial on making your own denim pocket. I used my fave paper, but I also provide some suggestions for distressing some regular paper to achieve the same look in case you don't have a denim in your stash. And of course, your pocket could be plaid, striped or even chevron! First I made a simple template. Next, I traced it onto my favorite paper. and then some TH Old Paper Distress Ink. Last, I added some stitching using yellow thread for a realistic effect. You can get fancy with zig zag stitches and even some bling, but I was going more for a classic Levi's look. Here are the two versions of my pockets. I made a mini version of a pocket for a layout about my Dad for the Whimsical Musings Challenge and CKC Mini Challenge #1. Seemed like the perfect little addition to ground my cluster of flags, a cloud and a flower. Hmmmmmm...what will you put in your pocket? I peruse the internet...a lot. I enjoy many sites and blogs and file away lots of scrappy ideas for future layouts...sometimes on pinterest, sometimes bookmarked on my computer and sometimes just in my head. Today's layout, "Please Pass the Ketchup!" was inspired from a few different places. 1. The inspiration kit. When I saw the splash of ketchup on the page with the food paper piecings, it reminded me of these photos and experience we had at Disney World. 2. The October Afternoon blog. I recently saw this tutorial highlighting these simple arrows. These prominent symbols would definitively indicate the star of the layout...the ketchup. 3. My scrap buddy, Pam (aka Whimsical Nature) as seen here. Three times a charm...so arrows and ketchup it is! It always amazes me how some willy-nilly stitching and paint splatters add so much interest. If you've ever been to the Whispering Canyon Cafe at Disney's Wilderness Lodge, you'll understand the joke here. The good thing is my family does really LOVE ketchup! Be sure to keep your eyes open to all the ketchup (oops!) I mean inspiration around you! I know I'm biased, but I just adore these photos of my daughter. These were taken when summer was fresh and new (actually, it may have even been before the official start of the season!). I love the perspective of the main photo where she looks as if she could hand you the daisy right through the page and the fact that I can zoom in on the top right photo for a close-up with such clarity. My previous camera wouldn't have yielded as clear results. Anyway, these photos and my "Picnic Parade" kit seemed like a good match and I think the collection did them justice. And now for a round of "He loves me...he loves me not!"